Welcome back The Painted Fern ! We are so excited to welcome back Jocelyn O' Gorman. She is so talented. You can see more of her Creations at www.EarthAngelsToys.com Jocelyn will be teaching classes in the Shop soon. Watch for her offerings. We feel so honored to have so many TALENTED Gals at Antiques In Old Town. Our Annual Spring Open House is 22 Days away ! 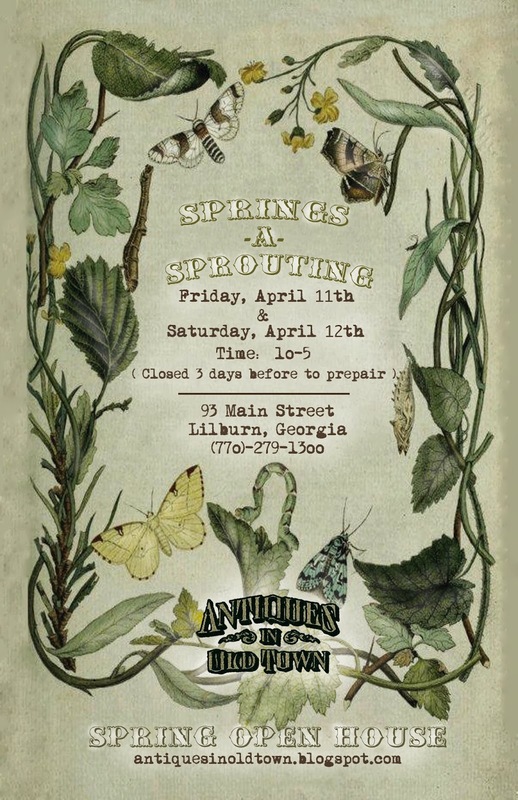 Springs - A- Sprouting April 11th and 12th 10:00 to 5:00 Offering the best Spring home and garden decor. Lots of Antiques , Collectibles , Vintage Goods and One of a Kind treasures! Shop will be Closed on the 8th - 9th - and 10th to prepare. See You There ! Just back from four days of treasure hunting in North Carolina. Wow is it getting harder to find neat Antiques at good prices ! I have never worked so hard to come up with new items for the Shop. After 15 Antique Malls and various Shops I came home with a few treasures. Time to get them ready for the Shop. Clean and price ! Come on by and see what I found. Shirley Wilson has brought in more treasures for her booth. A cute chair with red geranium fabric has already found a new home. Shirley sews the BEST pillows...love her new green and brown ones ! We got in the Sweetest little Twin French bed. Curved bottom with the prettiest floral design on the headboard and foot board. Perfect for a little Princess !